Hi there! I’m Ashley Lohse, the founder of Strong Beginnings, and I have a passion for newborns, chubby little cheeks, and growing families. 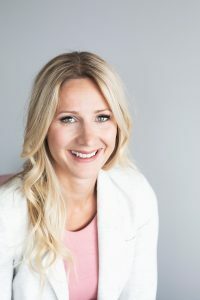 I emigrated from England to Canada in 2009 and I worked as a professional nanny for seven years, helping hundreds of families find balance and support as parents. However, nothing could have fully prepared me to have a child of my own. In 2014, we welcomed our little girl, Hadley, into the world and I was tired. So, so, tired and so overwhelmed. At the tender age of 3.5 months, she had gone from being a happy-go-lucky, sleep-anywhere baby that I loved showing off, to an utter train wreck. Sleep deprivation hit so hard, so fast. I felt helpless and like a failure, unable to distinguish what she needed. Was she hungry, gassy, or colicy? The one thing I knew for sure was that she was just as sleep deprived as I was. I searched, and I searched, and when I came across a Sleep Consultant, I chuckled to myself thinking, “The Kardashians use these guys, not me.” However, as the sleepless nights added up, this service that I thought was a luxury became a necessity. I could spend $500 on sleep training, or thousands on marriage counselling and postpartum medications that I didn’t want to admit that I might need. Fast forward two weeks and my beautiful little Hadley had mastered the skill of sleep. I was able to distinguish her needs, bedtime lost its anxiety, and my husband was able to take over the duty of sleep times and find his purpose in parenting. With reclaimed energy and freedom, I was finally able to take care of myself and my daughter without compromises. When our son was born, I was prepared with the tools and strategies for newborn sleep that set him up for sleep success – without missing any baby snuggles! This experience was so life-changing for my family that I was compelled to learn all the I could to educate and support other parents who are struggling with sleep challenges. In 2016, I trained as a Sleep Consultant, and I have since worked with hundreds of families across the globe, and I have a 100% success rate with families who complete the program. As a professional, I believe that I should be held to a high standard, and I have taken additional courses to grow my knowledge-base and help my families better. I am now a certified Maternity Nurse, certified Potty Trainer, and I have my Infant CPR and First Aid. The parenting world is full of controversy. We receive an overwhelming amount of information and advice from well-meaning friends and family to online groups and blogs offering conflicting advice. This confusion is why I founded Strong Beginnings. We help coach you through the most common parent complaints, with life-changing solutions that build your confidence as a parent. I want you to be the best you can be, all while honouring your own parenting style and philosophy.